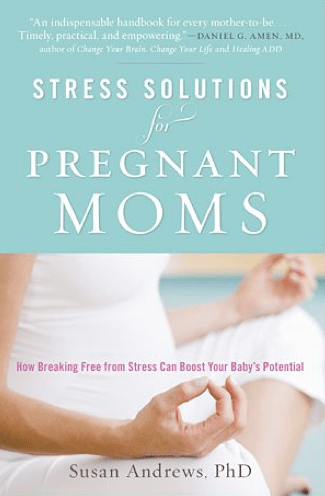 Dr. Susan Andrews has written an essential guide for the pregnant mom about stress and her developing baby. Dr. Andrews, a New Orleans psychologist, neuropsychologist, and researcher, has captured the essence of a major societal problem and turned the spotlight on it. She draws from theory, research, and application, as well as her own extensive experience, to create this engaging self-help book with an eminently important message: The modern woman who is growing a new child must be aware of and in control of her stress level. Stress Solutions is a must read for childbearing women of all ages, but also fathers-to-be, grandparents, health psychologists, and physicians seeking to understand the mother’s true wellbeing. Andrews points to an alarming and dramatic rise in children’s health issues, and shows that while there are many contributing variables, stress is a critical and often unacknowledged risk factor. She clarifies that the issues are not simple cause-and-effect, but that variables come together in “complex ways to shape the baby’s development in the womb.” Pointing to research she explains that the risk factor for stress may be as serious or more so than those associated with smoking or alcohol. Stress Solutions puts into the hands of the reader the power to influence their own and their babies’ health. Andrews’ writing also offers a pleasing subtext, a woman’s book written by a woman. Her voice is authoritative, kind, and encouraging–but also firm. Like the tribal wise woman, she explains to us what’s at stake, and it is momentous. But she is also there to teach, encourage, and guide. She lightens the tone at times with a spoonful of sugar here and there, touches of wisdom, humor and well-chosen metaphors. For example, she strategically places the phrase, “Now is a good time for a relaxation break,” at various points in the text. Andrews knows her cognitive psychology. The message sticks to your mind as if covered in Velcro. A Chinese proverb warns, “That the birds of worry and care fly over your head, this you cannot change; but that they build nests in your hair, this you can prevent.” Nests in your hair? That sticks too. Dr. Andrews’ A-B-C Formula is ingenious. She engages the reader seamlessly in a simple, practical treatment plan, by using baseline assessments of stress and of relaxation activities. She shows the reader how to calculate the “deficit” in relaxation efforts, and then lays out a comprehensive set of behaviors to fill that gap. Stress Solutions is a well-structured text, combining the latest scientific findings in Part One, “Stress and Your Pregnancy.” While leaving some wiggle-room, Andrews pulls no punches about the significance of the topic, showing how stress affects the mother-to-be and also the alarming new evidence that a pregnant woman’s stress level can affect her child for years to come. Part One is both educational and motivational. Andrews also points out a “dangerous misperception of stress.” She explains in the annual APA study on stress, 30 percent rated their stress as extreme, 52 percent complained of fatigue and sleep problems, and 65 percent to irritability. However, Andrews points out that 81 percent still believe they are handling stress well, a “glaring contradiction,” she notes. Part Two, “The Stress Solutions Formula,” introduces the steps and components that go into the complete stress monitoring and stress-lowering plan of the book. Returning to Balance,” “Six Factors That Can Affect Your Baseline Stress Level,” and a variety of case studies. She includes a chapter on how sound and music can lower stress, anxiety, and cortisol. Part Three, “The Stress Solutions Resource Guide,” lays out the treatment component of the Formula, allowing the reader to create her own personal plan for lowering stress. In her “Directory of Resources,” she describes activities for breathing, music, mental such as prayer or meditation, physical such as yoga, biofeedback, and pampering, like naps and massage. Each is given a rating and a number of “Relaxation Points,” and folds into the overall stress reduction plan, nicely wrapping up the program for the reader. How did Dr. Andrews decide to write Stress Solutions? “For years,” she said, “I had been interested in the results of a study that was conducted in 1991-2 in Paris. The study showed that a specific program of listening to music through headphones reduced the stress of labor and raised the apgar scores of the children who had a more normal average birth weight. Early in their development, the children were found to have better social skills and a more easy-going temperament than their siblings.” She asked why and that got her thinking. perhaps for youngsters. “I think that there needs to be a guide to help the children who are challenged by stress, worry, and anxiety,” she explained. Medicine and Psychiatry, and Clinical Coordinator and Neuropsychologist at Center for Head Injury Rehabilitation, East Jefferson General Hospital. She received her first PhD in Child Psychology from Tulane, and did a full retraining in Clinical Psychology at U. of Southern Mississippi. She headed a grant for Parent-Child Development for ten years and then managed the replication of the work for the national level, as Research Coordinator from the Bank Stress College of Education in New York City. This entry was posted in The Bookshelf on July 15, 2012 by admin.